In the four centuries since its invention, the telescope has transformed how humans view the universe and their place in it. But what do most of us know about telescopes themselves–their history, how they work, what they are being used for today, or what the next generation of billion-dollar telescopes will look like? In The Telescope, Geoff Andersen fills in all the details for us in an accessible, nontechnical way that will appeal to the amateur astronomer and anyone else who has been more than a little curious about this amazing instrument. The book covers every aspect of optical telescopes–from the humblest backyard setup, to state-of-the-art observatories, to the Hubble Space Telescope and spy satellites. 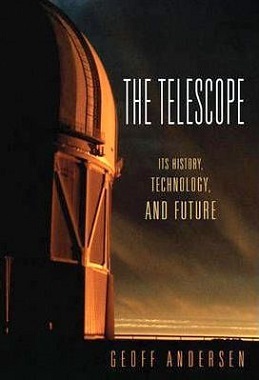 Chapters describe the development, design, and operation of telescopes; how observatories are sited, engineered, and built; variations such as solar and liquid-mirror telescopes; and some of the key astronomical discoveries telescopes have made possible. And there are plenty of surprises along the way. We learn, for example, that most of today’s professional astronomers never even look through their own telescopes, relying instead on digital imaging, measurement, and analysis–or even remote computer control of a night-shrouded observatory on the other side of the Earth. But, as The Telescope explains, these magnificent instruments do more than simply peer into space. They project and receive laser beams–for communicating, mapping, and making detailed observations of the Earth. They also look down at us from spy satellites, providing secret images to intelligence agencies–and, increasingly, giving a curious public access to more pedestrian images. The Telescope is the ideal introduction to a fascinating instrument that has taught us so much–but that most of us know so little about.